LOS ANGELES (CN) — In a case pitting the rights of property owners against neighborhood artists, an illustrator has sued a Charles Bukowski-inspired bar for painting over his mural without giving him notice. In a federal lawsuit filed Monday, Monte Thrasher sued Bukowski’s bar owner Marci Siegel and her boutique gift shop Co-Op 28 for violating a law protecting artists’ work, after the bar hired workers to paint over his mural with an homage to Bukowski. Thrasher says his mural “Six Heads” was influenced by his science-fiction designs for “Star Trek: The Next Generation” and other shows, and was “beloved” in the neighborhood. But three years ago the bar owners painted over his mural on a wall at the corner of Kingswell and Vermont, without giving him the 90 days notice required by the Visual Artists Rights Act. 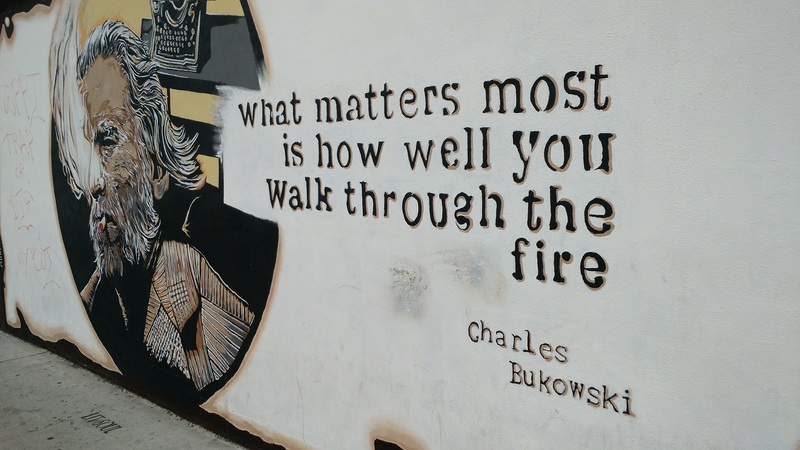 The mural of Bukowski is in an artsy area of Los Feliz, dotted with clothing stores, bars and restaurants. The few Los Feliz residents who passed by the mural Tuesday afternoon seemed to have no idea of the earlier work’s existence and were indifferent when the Bukowski mural was brought to their attention. Standing among racks of colorful boho clothing and vintage dresses and shirts, Dillon said he had seen more people take pictures of Thrasher’s mural than of the Bukowski. A few doors away, D.J. Chavez, 36, who runs a skate shop called Kingswell, said he had known Siegel for several years. A Bukowski fan, he was introduced to the author when he read his book “Notes of a Dirty Old Man.” He had seen fewer people taking shots of the mural and more people interested in the Bukowski homage, which has drawn more people to his store, he said from behind a glass counter. But Thrasher claims that his mural was an iconic presence in the neighborhood and that Los Feliz residents were so outraged they took photos as workers painted over it. He says his artwork displayed his email address and that workers could have contacted him before they began painting. According to Thrasher, residents asked the workers to stop, but they refused. Bukowski, who died in 1994, at 73, is known for his explosive debut novel “Post Office,” a semiautobiographical novel that detailed his life of hard drinking and writing while he kept up his day job as a mail carrier. He followed that up with a string of novels and short story and poetry collections that gained a wide following. Bukowski has been called the “laureate of American lowlife.” He used to live in Los Feliz on De Longpre Avenue, and the bungalow has become a literary tourist attraction. Siegel was not in her store Tuesday afternoon and did not immediately respond to an emailed request for comment. Thrasher’s attorney Eric Bjorgum is on the board of directors of the Mural Conservancy of Los Angeles. The intellectual property attorney won a $1.1 million settlement for artist Kent Twitchell after he filed a 2006 lawsuit under the Visual Artists Act. Twitchell sued after his mural the “Edward Ruscha Monument” was painted over. Bjorgum said it was “incredibly insulting” that the mural was painted over without the artist knowing about it. “It’s a tension between the property owner who says, ‘I can do whatever I want with my property,’ and the artist who says, ‘It may be your property but it’s my artwork,’ and legally if it falls within the narrow protection of that act, the artist has the right to prevent the property owner from destroying the artwork,” Bigman said. Thrasher says in the complaint that he received a “curt response” when he contacted the company that managed the building where his work was displayed, and that when Bjorgum wrote to the owners, they did not call back. Alleging violation of the Visual Artist Act, the California Preservation Act, and conversion, Thrasher seeks damages and a court order allowing him to restore his painting on the wall.